Is It Aurora Pants or Aulora Pants? I thought of sharing this interesting information. I’ve been looking at my blog analytics and noticed many people are search for Aurora Pants and found my web site. Are they looking for Aurora Pants or Aulora Pants? I found it very interested and decided to do some research. 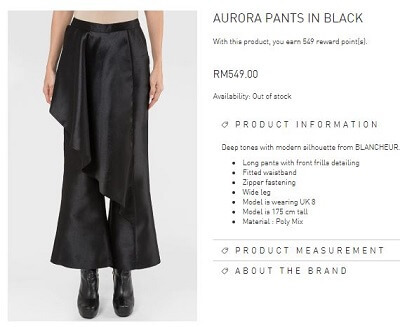 Apparently, there is a fashion garment known as Aurora Pants in Black by Blancheur. It is a poly mix long pants for women. There is another web site locally that carries this garment. The last time I looked, it costs almost RM550! If you are looking for women fashion pants, I’m sorry, you got the wrong page here. If you are looking for a wellness pants from Japan that can help you to improve your blood circulation and slimming, yes, that is the Aulora Pants with Kodenshi. I’ve already written my personal experience wearing the pants. Would you like to know more about the Aulora Pants? If you do, click the link below to contact me through WhatsApp and I will be able to assist you.